Mon coupain was thoughtful and wonderful enough to get me a colourful bouquet of flowers a few days ago, just because. 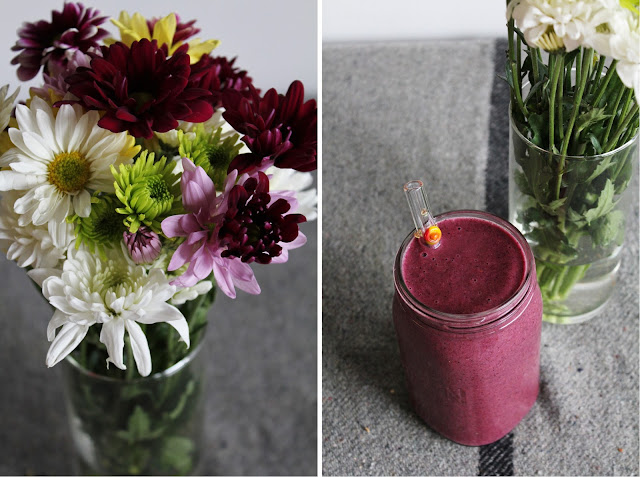 They looked so pretty one morning so I HAD to photograph them, and why not with a smoothie? It's a very simple recipe that I have almost everyday after I exercise. Enjoy! Blend everything until creamy and smooth, adding water as needed for the desired consistency. Sip away. Lucky lady! Flower surprises are the best. They go perfect with the smoothie colour! Love the glass straw, too. Ain't no other straw to use =) Thanks! That is my fave combination of smoothies! Love the simplicity and seriously blueberries... mmmm cannot have enough! I usually add hemp protein powder to my smoothies. Hemp seed would be a great variation! I seriously love these especially during the summer months. As always your recipes rock. Stay Lifted! Yeah! Glass straws are awesome, and not really expensive either. About $8 per. This looks good! I’ve never been a smoothie fan but the color make them more appealing. This might be a good summer breakfast when it gets too warm for oatmeal!